Gearbox CEO Randy Pitchford also teased an entirely new IP for next-gen consoles. Randy Pitchford, CEO and president of Gearbox Software, spoke about his company's plans for the future in the latest episode of the Nerdist podcast. Specifically, new DLC for the wildly successful Borderlands 2, and the not-so-successful Aliens: Colonial Marines is inbound, and the company is working on a brand new IP that will be released on next-gen consoles. "In our case especially, we are not launching any new full products for the current gen again. So we've launched the last of our current gen products and everything we've got in development is for next gen. We have some things that we are supporting for current gen, like there will be DLC for both of our most recent games for the current gen that are still to come." While he doesn't specifically mention Aliens: Colonial Marines by name, he does say "for both of our most recent games," and Aliens: Colonial Marines was Gearbox's most recently released title. 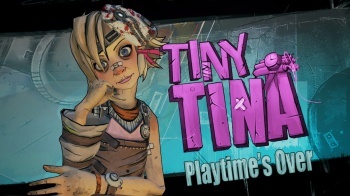 He does later clarify that Tiny Tina's Assault on Dragon's Keep will not be the last we see of Borderlands 2. He doesn't get too much into the specifics of the new IP, except that Gearbox will be officially announcing it "sometime later," and it will be something completely different from its previous games. Pitchford also talked about the process of making videogames, and where he gets some of his ideas from, including some interesting anecdotes about how Gearbox first got started. He offers his thoughts on the next generation consoles, specifically how much the PS4 has impressed him so far.